In preparation for our meeting on Transparency, Recognition, and Innovation in Peer Review in the Life Sciences on February 7-9 at HHMI Headquarters, we’ve collected some recent (and not-so-recent) literature on journal peer review. A full annotated bibliography can be found at the bottom of this post, and we invite any additions via comments. To make the list more manageable, we’ve highlighted some of the most crucial content here. This massive review from Jonathan Tennant et al represents a comprehensive discussion of the origin, evolution, and challenges surrounding modern peer review. Of particular note is Section 1, which offers a history of peer review and an overview of critiques of the system, and Section 3, which discusses how platforms like GitHub, Reddit, Amazon, and Stack Overflow could catalyze innovations in scholarly peer review. “Figure 2. 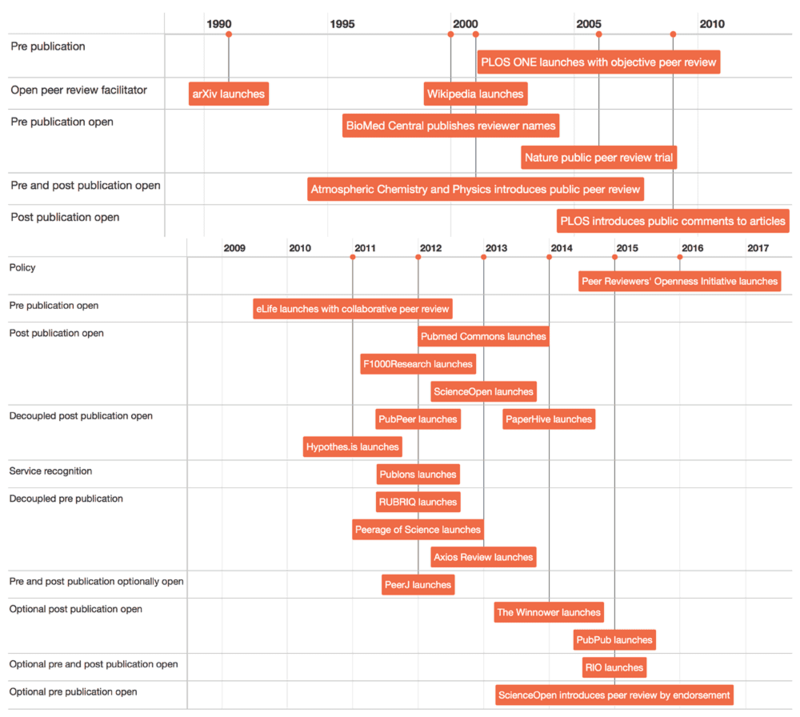 A brief timeline of the evolution of peer review: The revolution. The very term “open peer review” means many different things to different people. It can refer to revealing reviewer identities or the content of their reviews, allowing reviewers to discuss the article with one another or the author, or a process in which reviewers don’t need to be invited in order to offer feedback. Indeed, Tony Ross-Hellauer has identified 122 definitions for open peer review. We’ll use this taxonomy throughout our discussions on this blog and at the meeting. 3. 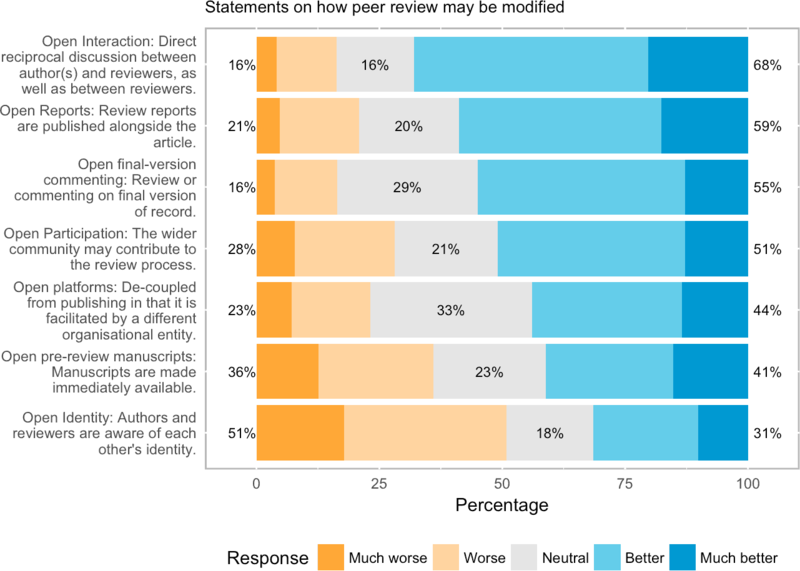 Survey on open peer review: Attitudes and experience amongst editors, authors and reviewers. The taxonomy identified above was used in an online survey completed by over 3,000 scholars, 95.5% of whom authored an academic communication and 87.6% of whom had experience as reviewers. While the respondent pool skewed heavily toward earth and environmental sciences (41.6%), 14.6% of respondents were biologists and 14.5% were in the health sciences. Perhaps because this was an opt-in survey conducted by an organization devoted to open access, the respondents sampled were a bit more cynical (but not dramatically so) about the current peer review process than people who had responded to a previous study conducted by Mark Ware for the Publishing Research Consortium. One highlight of the report is Figure 8, reproduced below, which reports attitudes toward the seven traits of open peer review identified in Ross-Hellauer’s F1000 paper. Respondents had largely positive views toward open interaction, open reports, and open commenting. Interestingly, all of the “traits” save open identity were regarded more favorably than open pre-review manuscripts (ie preprints)! Given the growth of preprints in the life sciences and other disciplines over the last few years, these data suggest that peer review might be ripe for even more radical change. During Peer Review Week this fall, Crossref—the non-profit organization that issues DOIs for scholarly journal articles (and preprints)—announced that it will also offer a type of DOI specifically for preprints. Registration opened in late October, and the accompanying documentation suggests interesting and helpful use cases. For example, “contributors” to the review can include (in addition to regular “reviewers”) assistant reviewers, stats reviewers, or translators, and all may be anonymous. The metadata contains fields to keep track of whether the review occured pre- or post- publication, the reviewing round, and the license under which the review is released. And the review can be linked to the object being reviewed (which doesn’t need to be a journal article). One barrier to driving change in peer review is that comparisons between different systems are often clouded by confounders such as different author and reviewer pools across journals or across time (in cases where policy has changed). They came to this conclusion in spite of their acknowledgement that it might “provide “more scope for power relationships to favour ‘the great and the good,’”” as pointed out by as Karim Khan. As the authors of the BMJ editorial have acknowledged, making peer review (and especially the names of peer reviewers) transparent can complicate the human relationships that make up science, especially for reviewers who are junior or otherwise marginalized or vulnerable. To get at some of these issues, Jeremy Yoder has compiled short pieces written by members of his community to explain why they don’t sign peer review. Given these concerns, what benefits are gained by removing or preserving anonymity in peer review? And is posting review reports (without reviewer names) similarly complicated by concerns for protecting authors? We’ll discuss this (and more) on February 7-9. Tune in to the webcast and join the discussion on Twitter with #bioPeerReview. Meta-analysis suggesting that there is low inter-rater reliability between reviewers (Cohen’s Kappa: 0.17). One of two prominent 2017 demonstrations that editors select more male reviewers. This literature review distills over 100 partially conflicting definitions of “open peer review” into a taxonomy of seven traits. This survey of over 3,000 respondents (almost 30% coming from the life sciences) demonstrates attitudes toward various open peer review traits such as open identities, open reports, etc. This 2015 survey conducted by a publishers’ consortium offers a more conservative perspective than Ross-Hellauer’s 2017 work. Fermat’s Library is a platform and online community for discussing scientific papers. A response to Mayden (2012), this blog post contains a helpful list of existing guidelines to promote best practicesin peer review.